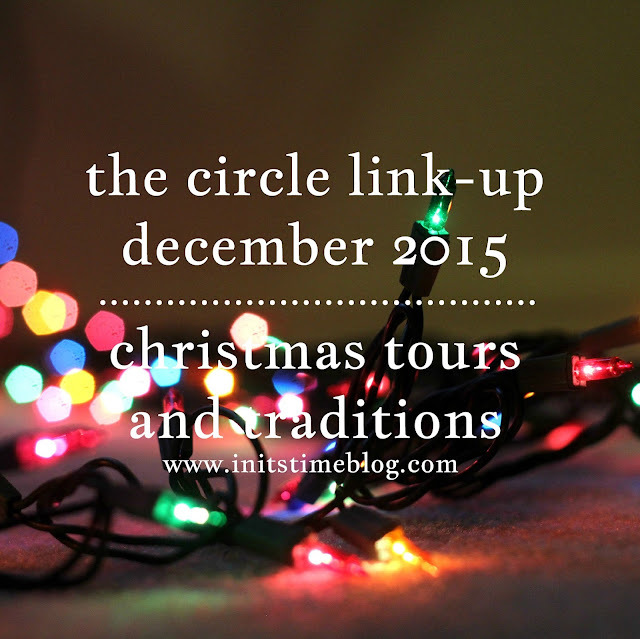 THE CIRCLE DECEMBER 2015 | CHRISTMAS TOURS & TRADITIONS. Happy December and Merry Christmas, friends! If you ask me, despite all of the craziness that is shopping, it really is the most wonderful time of the year. And I honestly could not have ended the year with a better (and more fun!) topic for The Circle. Which, is a crazy blessing in and of itself. So thank you, each and every one of you, for being a part of this community! In case you haven't heard, we're sharing our favorite Christmas tradition and our Christmas-ified home tours as well. You can share one, you can share the other, or you can get bonus points and do both (can you tell I'm a teacher?). But before you link-up and join in, take a minute and meet my co-host for this month. Katie (from Refining the Wild Grapes) has a heart of gold, is so incredibly sweet, and is also incredibly encouraging, too. Plus, she came up with this great topic, too! A little about me, I am currently working as a Graduate Nurse in my brand new home. I live in an adorable small town where they still decorate the town for Christmas. I went from St. Louis to a population of about 3,000 and love it. I married my best friend on October 3rd of this year and I couldn't imagine life without him. It's true when they say, "Wait for the right one..don't settle." I couldn't have dreamed up a better man for me. We also welcomed our newest little buddy to the family, our French Bulldog named Gus. He's seriously the best. When my husband and I aren't working you can find us spending hours looking through antique shops, riding 4 wheelers through the country or you can almost ALWAYS find me with a coffee in hand watching the Hallmark channel around this time of year. If you come say hello over at my blog, you'll find stories of a sinner saved by grace, personal reflections of trials and blessings and life lessons (some learned the hard way). I can't wait to read about your traditions and see all the Christmas decorations. This really is the most wonderful time of the year and I can't wait to meet you all. Go check out Katie's Christmas tour and see what she does each year for Christmas and then link-up below! We can't wait to see all the Christmas cheer around the blog community! Many of you long-timers probably recognize the ornaments and nativity scenes over the fireplace mantel. But for those of you who have never seen them before, they're not only the decorations that come out each year, but also a family tradition as well. There's a local store that sells nativity scenes made all over the world and it's a family tradition to find one and add it to our family's collection. We've got nativity scenes from Asia, Africa, South America, to name a few. Personally, my favorite is the nativity with baby Jesus on top of the bus. This year, we decked out the living room with twinkle lights (which conveniently stayed up since Thanksgiving!). Who knew that twinkle lights could make a room so much cozier? Apparently we did not, otherwise we would have done this ages ago! It's your turn to link-up! Grab a button, enter in your link, and if you do link-up, please visit and leave some Christmas cheer for at least ONE other blogger. This isn't just a chance to promote your post, it's a chance to meet others, too! Have fun and Merry Christmas! It's nearly 2016! With a new year, come new goals and inspiration for the upcoming year. Next month, we'll be sharing our Goals and Inspirations for 2016 in a moodboard! You could include places you'd like to travel, books you'd like to read, hobbies you'd like to learn, or maybe a word that is speaking to you for the year. Create a fun collage to throw them all together and come back on Wednesday, January 20th to share them with us!